For all the ethereal chiffon floating about, Antonio Berardi certainly knows how to ground his idea of clouds with a silver lining. And what a lining it is. Berardi has armored his girl with metallic patent leather which has wound its way up the chiffon and crepe in gorgeously elaborate embroidery. They are more obviously seen as intricate breastplates encased in the gowns that opened the show, adding a touch of edge to an otherwise sweet evening gown. Moreover, his particular brand of romanticism feels very modern. The exquisitely tailored sheath dresses and sharp shouldered jackets lose none of the intricacy but provide a very structured counterpoint to the fluid peacock train of the gowns. And while the silhouettes remain classic, they hardly feel like the reliable staples we have come to know. Berardi’s play on texture is intriguing. He shifts the idea of soft and tough by turning lacquered leather romantic and crepe strong, making his spring both wonderfully fluid and elegantly controlled. There is a confidence to this collection that is lovely to see. 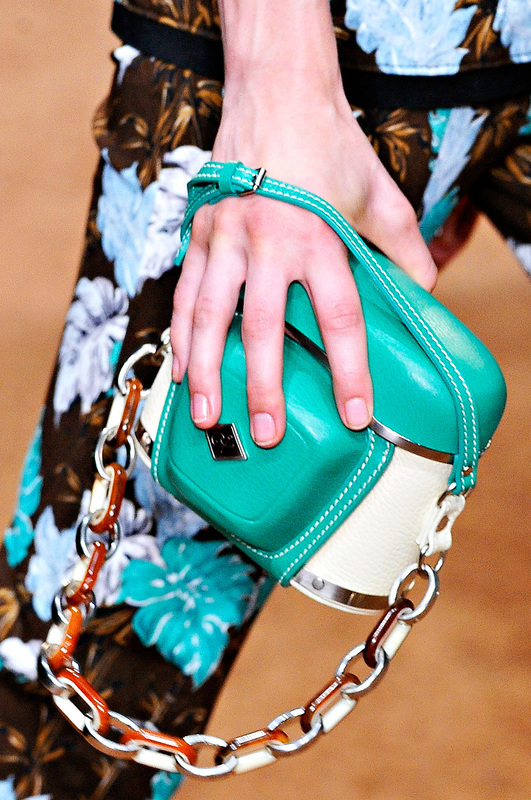 Peter Pilotto messes with my eyes–in the best possible way. 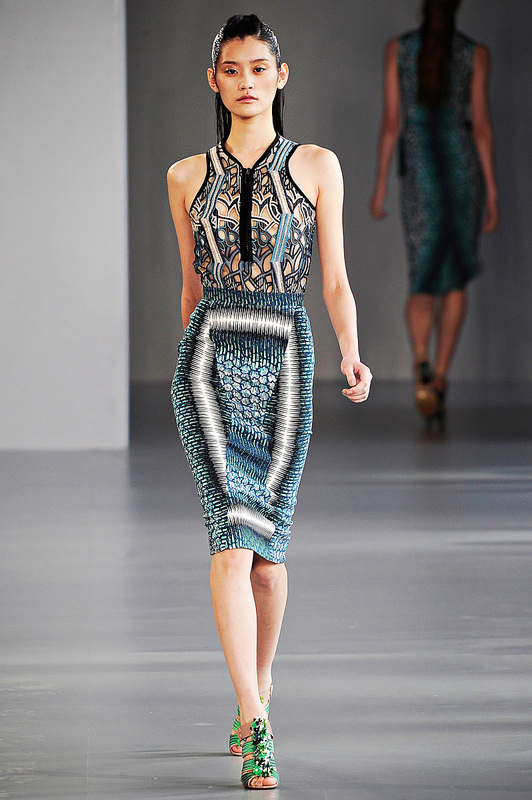 With their kaleidoscope of digitally enhanced mercury print in all its festooned glory, Peter Pilotto and Christopher De Vos have crafted together a rather awe-inspiring glimpse into the jungles of Indonesia and the blue blue waters surrounding the Pacific Islands all wrapped in futuristic cocktail dresses and eveningwear. I love how this collection has all the exaggerated drama of haute couture and the modern sleekness of prêt-à-porter, showcasing some fantastic geometric shapes. Moreover, the surfer and scuba feel to both the print and cut of the dresses add a different type of sophistication to the look while keeping the line relatively clean. Pilotto and De Vos has a unique take on things, showing off a vibrantly innovative series of looks which grew only better as it went on. As to be expected, I was immediately drawn to the striking cut-out dresses and tops. I love how they feel edgy and sporty rather than sensual and coquettish. As Chioma Nnadi puts it Pilotto has “combine the sporting dynamism of a bathing suit with the chic dimensions of a cocktail dress, but when you dismantled those looks, the neoprene gillets and pencil skirts had a cool surf-and-turf appeal all their own.” Lovely little collection. I feel be looking forward to seeing what they come up with next. There is just something about Acne that is just so compelling. Jonny Johansson has an appealing take on minimalist simplicity; his pieces always have great shape and volume. Moreover, he likes to march to the beat of his own drum, providing an intriguing mix of styling and a fantastically rich (not to mention unusual) color palette. Sharply cut pieces are shown in lime green, burnt orange, and warm pinking to a startling chic effect. And it is most certainly a far cry from the skinny denim line Acne had started out as. Acne in recent seasons has come across rather sophisticated while remaining grounded in the street style roots Johansson emerged from. I love how he has juxtaposed edgy wrinkled leather and biker jackets with clean A-line skirts and well-tailored separates, blending the two into a fresh look. I even enjoyed the ombre lowlights (although a little crazy and messy up close) that complemented each look. They add a grittiness to sleek lines and classic tailoring. Overall, his collection is both classically elegant and modern downtown as his playful experimentation is supported by his superb technique. 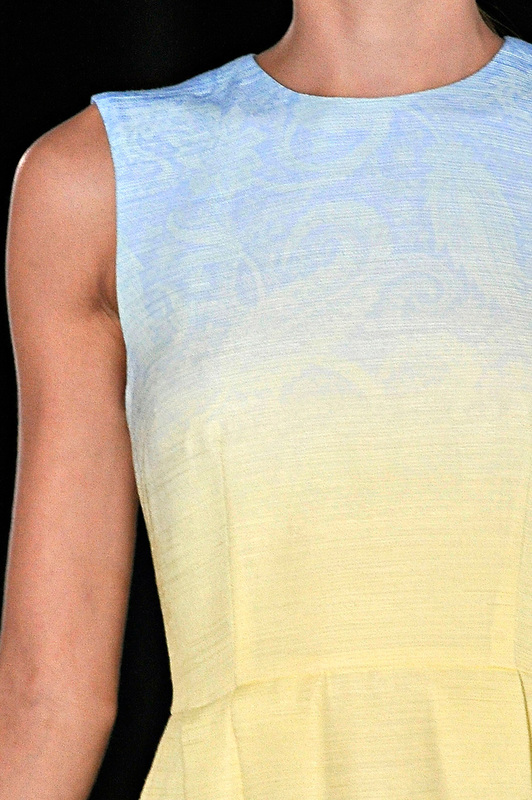 After a rather strictly tailored Fall 2011, Jonathan Saunders has ushered in spring with an easy full A-line silhouette. With a sunny vibrant Miami color palette, he has put together a beautifully polished collection that is both practical as it is pretty. And amid that pretty is a very wanted modernity–something Jonathan clearly understands. There is something sleekly romantic about what he has put together with the gorgeous prints and bright dreamy color combinations painted across the clean lines. Jonathan Saunders has always been a master in tailoring; spring is not so much a relaxation of that but rather an evolution to it. There is a wonderful fluidity to the pieces that blends beautifully with the two-tone waffle knits and ombré’d jacquard textures to great effect. I love the ease of movement to the pieces and how none of the control to the shape is lost. Sarah Mower coined it best: “dynamic mobility.” Because it is so utterly befitting. His interpretation of Miami Deco pastels is brilliantly lit with a presence that suits both the office and a night out. Moreover, his interest in negligee details adds a light counterweight to the pencil skirts without being too whimsical. If anything, this collection just demonstrates that Jonathan Saunders is one to watch. The reaction of the crow totally reflect my own: ““Floaty but not fussy,” said one woman outside. And another, “You know what? That man just gets it.”” Concept and inspiration are all good and well but can easily get lose an audience. Moreover, sometimes, a girl can’t help but want to feel pretty without the frills. And I will certainly credit Jonathan Saunders for snapping me out of my apathetic daze that occurs during London and Milan. Bravo! Ah the wonderful world of Marc Jacobs. With his flair for theatrics, Marc has a true knack for putting on a production; he always tells the story of his collection just so. And this spring, he delights us from the moment those gold lamé curtains part with what many have deemed Marc Jacobs: the Musical. Having all the models onstage and already perfectly styled takes great forethought and is not without risk. However, by doing so, the audience pulled into the world of Marc’s making (in all its Bob Fosse glory) before anyone even begins to walk. Add in a Phillip Glass soundtrack chanting about Marc, and you lose yourself to the wonder of a Marc Jacobs collection. Far removed from his decadently tailored fall, Marc has returned to the sweetness of spring with his twist on twenties style with remixed cloche hats, drop-waist chemises, and shiny gingham prints. He plays with our perception of what I take to be the 1920s housewife, turning loosely draped dresses and sweet gingham urban and edgy. Moreover, Marc leads us in an adventure in fabric. His entire collection gleams with an abundance of sequins, tinsel, taffeta, and cellophane organza. Trust Marc to spin raffia in a whole new manner by shredding the cellophane and crafting it into the tiers of a pencil skirt. Far from feeling too cute, Marc gives us something surprisingly sophisticated and fiercely fresh. The silhouette remains elegant and beautifully tailored while his creative fabric choices make this sharply memorable –an electrifying and exquisite end to New York Fashion Week. 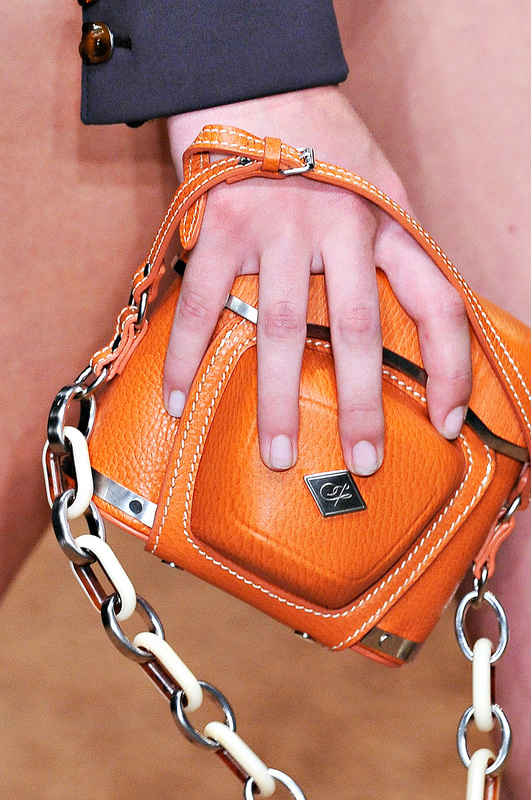 Proenza Schouler has managed to grow up without losing any of its nonchalance or innovation. Jack McCollough and Lazaro Hernandez has taken kitschy elements from the fifties, added in tribal earthiness of the safari, and woven them into a rather sophisticated and coolly polished collection. With so many references, one would think that this would result in a hodgepodge of retro pieces and loud prints. And that would likely happen–if this were anyone else. However, these boys hardly lose any of their modernity or wit with Spring 2012. In fact, they have fashioned together something that is effortlessly urban, playfully creative, and utterly them. That being said, this type of style is definitely not suited to my own. I have no great love of kitsch or safari-themed clothes. And I rarely enjoy a loud print. Jack and Laz made me love this in spite of that. Certainly, there is a sassiness to the walk and each look that I immediately glommed into. In fact, I was enthralled by the way the pieces moved in general. Each has a lovely flow about it, molded into sharp silhouettes and sleek lines. But it takes more than that for me. Many designers can control shape and give clean lines. However, few, if any but these two, would think to craft them out of deeply lacquered leather reminiscent of fifties diner booths (left). Or turn poodle skirts revealing by weaving them out of slicked raffia (right). I have a great appreciation for Jack and Lazaro’s creativity if anything else. Overall, I love how modern their spring feels. Even with the bags shaped like vintage camera cases (which utterly awesome by the way) (see above), there is an edge to the look. Clean sheath dresses have been expertly formed out of spliced patterns, including flashes of zebra print and conscientious color-blocking. Eel-skin side wrap skirts are shown in electrifying blue and orange while collegiate strips are given a twist glossy leather. And the boys certainly do not limit themselves to earthy tones: sea-foam green and soft turquoise make appearances amid the autumnal color palette. So in the end, Jack and Lazaro have taken seemingly far removed references and have bound them into a cohesive collection full of edge and elegance. For further detail on the references (and a much better review), read Hamish Bowles. Drama, drama, and more drama. 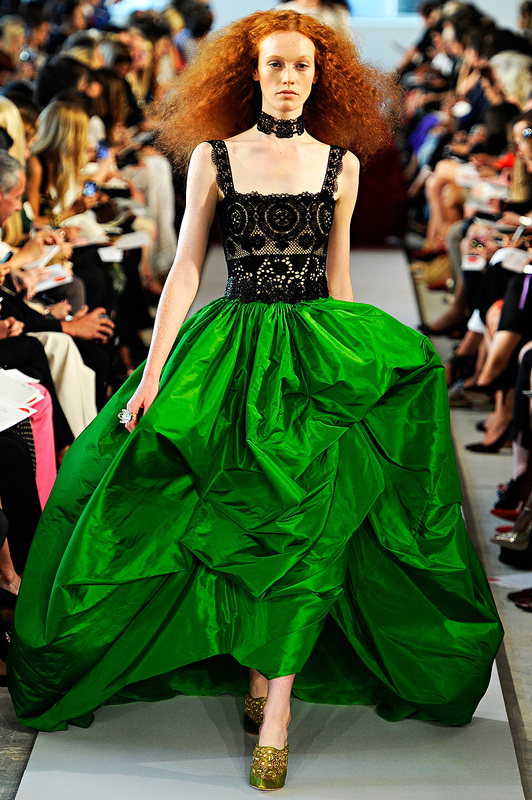 I love the direction that Oscar de la Renta has taken in recent seasons. Certainly this one will be the most memorable for me personally. This is the most vibrant youthful collection that I have seen from him. There is a joy and sunniness to this that I immediately liked. While the elegant sophistication remains from seasons past, there is an unfettered exuberance (as Hamish Bowles would say) to the silhouette this spring that is wonderful to see. Moreover, instead of waiting til the end to send out grand ballgowns, Oscar decides to open the show with a cascade of bright taffeta. I love seeing the explosion of volume (which of course never gets out of hand) and the exaggerated proportions. This volume is then balanced by cheeky cotton knit lace bodices which add a playful summer air to the gowns. 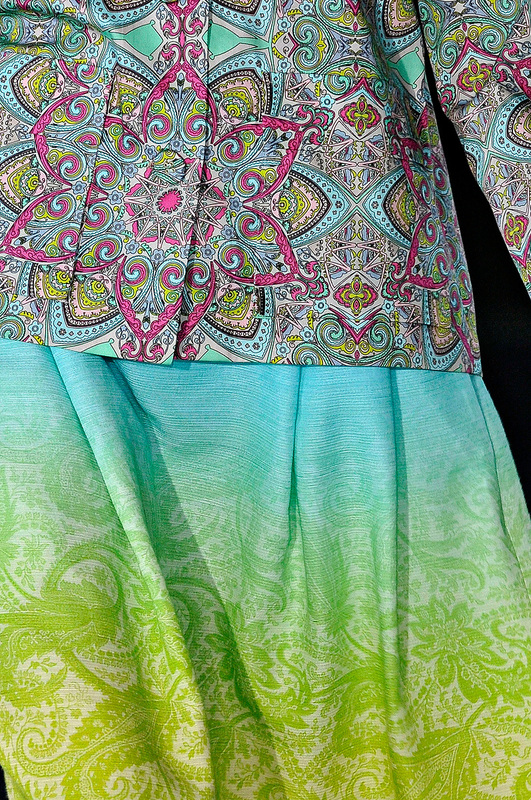 He continues along this vein by crafting luxurious sheath dresses out cotton lace and eye-popping colorful sundresses. Likely sick of the sleek straightened tresses, the models had wild voluminous hair to accompany the pieces. Overall, there is a romanticism to Oscara de la Renta without losing any of his practicality or abandoning his clientele. Georgina Chapman and Keren Craig shape tulle, silk, and chiffon like no other can. With great intricacy and art to their design, they have managed to craft a breathtaking fairytale. They weave this wondrous tale of epically grand opulence and whimsical grandeur. Chapman and Craig never stray from their vision and style; honestly, they really have no need to. I always eagerly anticipate where their imagination will take them next. So bring on the pretty. I always love the sense of old school glamour that Marchesa brings to the table. Inspired by Ilya Repin’s 1876 painting Sadko in the Underwater Kingdom, Spring heralds ethereal hourglass silhouettes and elaborate crystal beading. And while “restrained” would never be a characteristic that I would apply to Marchesa, there is a certain control amid the chaos. Even when festooned with tulle and feathers, the dress never overwhelms the model. Chapman and Craig are able to let their imagination run amok without ever going too far with their love of volume. Beautiful collection as always, ladies. 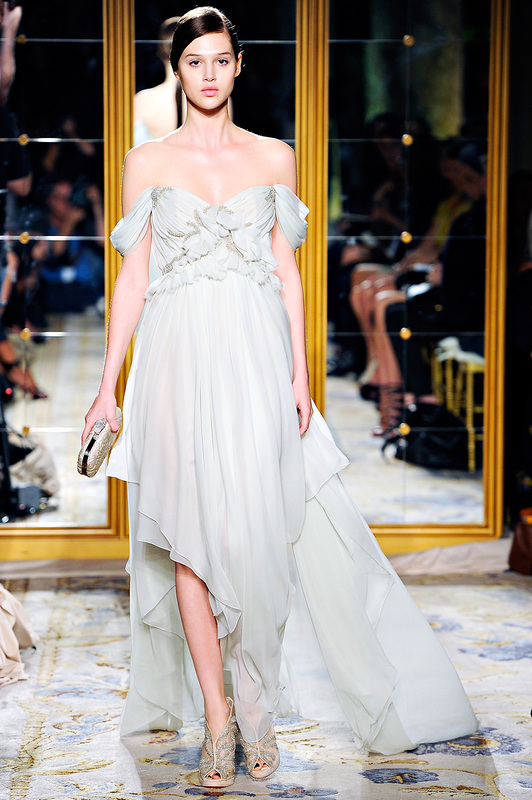 Oh, and yay for Marchesa’s first runway show! I would love give a more coherent review, but I’ll just let the beautiful gowns speak for themselves. To be honest, I was a little let down with this collection. After a dreamily romantic fall collection, this just simply cannot compare. Even as it continues the romanticized concept of the golden wheat fields of the Great Plains from Fall 2011. While I adored the gowns, I felt that some of the prints were too obviously digitalized. Possibly it was done that way on purpose, but it sort of ruined the magical wonder of the look for me. I started to ponder over the technique and construction rather than enjoy the piece as it is. That being said, some of the looks I really really loved. The Mulleavy sisters have a wonderful eye for detail, presenting fantastically fluted silhouettes with bright whimsical Van Gogh prints. I have always loved the poetic disposition of the Mulleavy sisters; this collection hardly changes my mind. And while I may have only loved a few pieces, they certainly know how to make me fall hard for them. 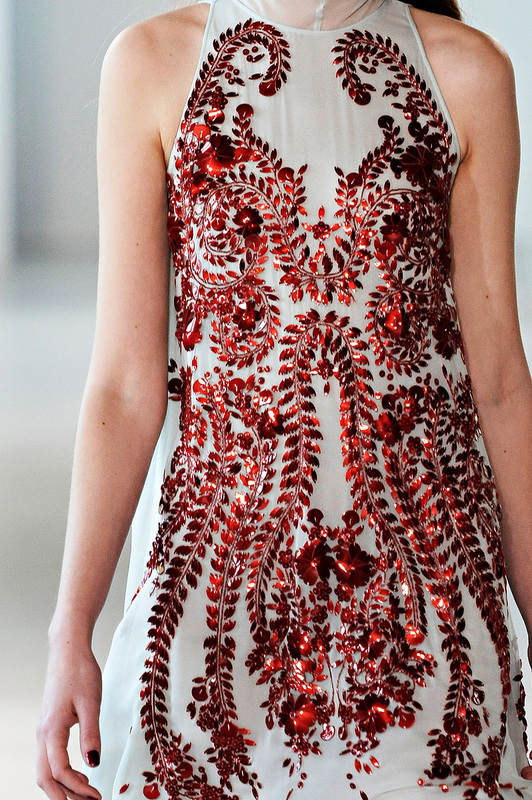 In general, I feel that Rodarte has a rather flower child-esque aesthetic. Yet, they give us something more than just seventies romanticism. There is a modern wholly all-encompassing appeal about their clothes where it can feel both edgily gothic, optimistically bright, and enchantingly fanciful. All quite oddly mixed and contradictory concepts. That type of versatility is rather remarkable considering how avant garde some of their designs can get. But that is exactly what I love about it; the duality is very unique. Moreover, there is a great sense of history to what Kate and Laura do. They manage to evoke technique and style of famed couturiers like Dior or Lacroix while still having a voice of their own. 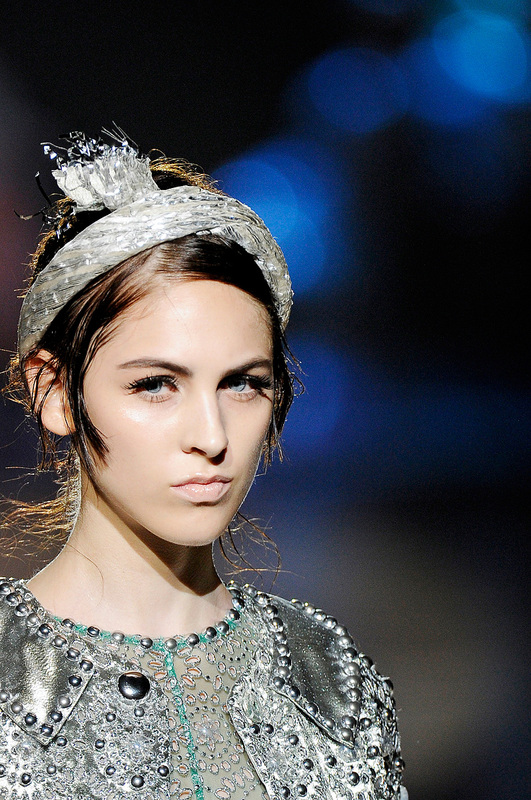 And, that is precisely why Rodarte will always be a brand to watch. It seems that Vera Wang has also taken a sportier route this season. Rather than coming across sweet, this is a refreshingly modern and sleekly futuristic take on eyelet patterns and fluttery skirts. I love how Vera has reinterpreted sportswear into rather sophisticated daywear while maintaining the expected Vera Wang aesthetic. Moreover, Vera has a great eye for shape and accents, adding texture and edge by breaking up the bodice into unique fastenings. The peplum hardly feels quirky and dated; rather, it flows right into the line and provides a little volume to an otherwise streamlined silhouette. I love how clean the lines are in general without any fuss or romantic bells and whistles. Vera has always excelled at bridal, giving sweetly romantic designs and silky accents. This collection demonstrates that she can do something more without losing sight of who she is.